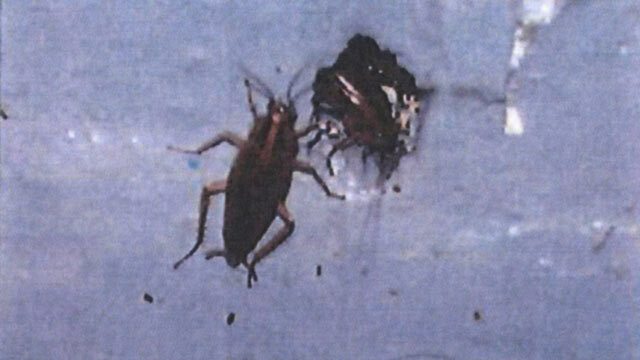 Cockroaches at an airline food facility, captured on camera by FDA inspectors. The image was made available to ABC News via a Freedom of Information Act request. You're accustomed to airline food that's bland, tepid or otherwise unappetizing. You're probably not accustomed to hearing that it was prepared or stored in areas crawling with mice, ants and roaches. But that's what the Food and Drug Administration (FDA) saw when it inspected airlines and their outside caterers. Through a Freedom of Information Act request, "20/20" obtained lists of recent health violation records from the FDA, the agency in charge of inspecting airlines and their outside food caterers. Over almost four years, the industry counted more than 1,500 health violations. "Significant" problems were found at a much higher rate than in other industries the FDA inspects, the agency said. "You put that all together, and you have a time bomb," said Roy Costa, a food-industry consultant and former health inspector. The FDA reported evidence of mice on Delta Airlines planes. In a statement, the airline said, "This clearly was an isolated incident and we cooperated with the FDA immediately to resolve it immediately after it was brought to our attention. The health and safety of Delta's customers and employees are Delta's top priority. We take this issue very seriously and have an established routine servicing program to inspect our aircraft." About other conditions found by the FDA, the airline said in a statement, "These FDA inspections, some dating to 2009, are related to inspections of lavatory service trucks and aircraft potable water. We began addressing the action items the FDA set forth immediately. Delta's deepest core value is the safety of our customers." Then there's LSG Sky Chefs, the industry giant that provides food to many airlines. Records showed company food facilities infested with ants crawling over discarded food, flies both dead and alive -- and roaches all over. If insects are in the room, they're probably in the food, Costa said. "You can't have insect remains and feces of rodents and dead flies [in these areas]," Costa said. In a statement, LSG Sky Chefs said, "Our facilities are inspected by several internal and external agencies, including the Food and Drug Administration (FDA). As with any FDA inspection, documented observations are indicated on a 483 form and if observations are cited at our facilities we immediately review and correct. In two cases, the FDA 483 forms led to the issuing of warning letters that were immediately addressed by us to ensure complete FDA compliance. "In the U.S., we cater tens of millions of meals per year that are subject to far more oversight than those served in other industries. Food safety and quality are our number one priority and our multi-layered quality control system has helped ensure the quality and safety of the meals we provide. These rigorous FDA inspections are one of many steps that assure the safety and quality of the meals we serve. All of our kitchens are FDA registered and are in compliance with the regulations." At company after company, the FDA saw things like dirty cooking areas, old or moldy products and employees not washing their hands. Gate Gourmet serves many top airlines. At their facilities inspectors found roaches, gnats ("too numerous to count"), unrefrigerated food, utensils on dirty racks, and more. In its defense, Gate Gourmet told "20/20" in a statement, "None of the FDA's observations ... indicated a threat to the health of the traveling public." Costa disagreed: "Those things are direct threats to public health." Gate Gourmet, LSG Sky Chefs and other caterers and major airlines told "20/20" they take food sanitation very seriously, and fix any problems immediately. They also said they serve millions of meals without incident. That may be irrelevant to those who claim they were the exception. In late 2011 the family of a Miami man sued American Airlines, claiming he died from eating bacteria-contaminated food on a flight. American told "20/20" his illness was unrelated to its food. In a statement, American said, "Mr. Cortes, a 73-year-old man traveling with his wife from Barcelona to JFK with an ultimate destination of Miami, required medical assistance approximately 35 minutes into his flight from JFK to Miami. We have thoroughly investigated Mrs. Cortes' clams and while we are saddened by the death of her husband, we are confident the facts will prove that his death was in no way related to food he consumed onboard our aircraft." And those who fly business or first class and think the curtain protects them from the risk of contaminated food should think again, Costa warned. "Fancy food isn't safe food. The bacteria really don't care." "Thank you for the opportunity to comment on the last three years of FDA inspection reports at certain Gate Gourmet facilities. "It's important to consider these reports in context. Form 483 is neither a 'warning letter' nor a direct threat of closure. It includes inspectional observations that do not represent a final agency determination of non-compliance. "None of the FDA's observations at Gate Gourmet from 2009-2012 indicated a threat to the health of the traveling public, nor did they result in a warning letter. "Gate Gourmet's goal is to be 100 percent compliant with all health and safety regulations, 100 percent of the time. We take our responsibility very seriously. Where any issues arise, we address those issues quickly -- in many instances, during the course of an audit or before the auditing agent even leaves our facility. "Our work with the FDA is important, especially in an operation of our magnitude. FDA inspections are a key element in the multi-layered processes in place at Gate Gourmet and within the airline catering industry. Along with FDA oversight, this system of controls also includes other government agency audits, customer inspections, continuous improvement initiatives, and our own quality assurance programs (through which we have outsourced food safety inspections to a third party to ensure objectivity). "We employ thousands of individuals and have rigorous controls in place under which we globally serve more than 250 million safe and high-quality meals annually, to more than 250 airlines. Food safety and security are our highest priorities, and our record is among the best in the food service industry. "We remain confident in our quality control measures and are continually improving our processes and technology. "You can find more information about Gate Gourmet's food safety protocols on our website by clicking here, and we encourage you to contact the International Flight Services Association for industry information, including the World Food Safety Guidelines the organization oversees." "With approximately 30 million meals served to American's customers every year, we take the issue of food safety very seriously. Most importantly, we support the work of the FDA and consider them a partner in holding our industry accountable to stringent food safety regulations. In fact, we encourage frequent and comprehensive FDA evaluations of our partner catering kitchens and believe their inspections, in conjunction with our own quality control efforts, have been highly successful in ensuring food safety for our customers and crew. "In addition to the work of the FDA, we work closely with our catering partners and have an industry-leading Performance Measurement Program which we mandate by contract with our caterers. American was the first U.S.-based airline to implement a comprehensive approach to overall quality management and our catering partners understand that failure to meet our stringent performance requirements can have significant contractual implications. Like the FDA, we frequently conduct unannounced kitchen evaluations to monitor all aspects of service to American, with a particular focus on food safety and hygiene. We follow well-established and stringent FDA guidelines and are continuously monitoring and updating best practices related to food safety and hygiene to ensure we are constantly improving the program." "Safety is the highest priority of the airline industry. Our members safely transport two million people every day and safely serve millions more meals and beverages each year. Airlines have programs in place that provide multiple layers of protection to ensure that they and their catering providers are meeting or exceeding world food safety guidelines, and they work closely with government agencies to rigorously inspect catering and airport facilities, and work to promptly address any issues and ensure complete compliance." "The traveling public can be assured that meals served on airlines are safe for consumption. Members of the International Flight Services Association (IFSA), global professional association for airline and railway personnel, inflight and rail caterers and suppliers to the industry, place the security and safety of the traveling public as their absolute highest priority. The industry has a solid food safety record, which is evidenced by the hundreds of millions of meals that are safely prepared and served on travel routes each year. Airline catering facilities are highly regulated and frequently audited by local, regional and federal agencies including the Food and Drug Administration (FDA). Airlines and caterers also have additional internal food safety protocols in place, that meet or exceed best practices in IFSA's World Food Safety Guidelines for Airline Catering, accepted by international airlines as the basic reference document for airline catering food safety." "Flying Food Group (FFG) is 100 percent committed to a close collaboration with regulators and auditors to assure the safety and quality of nearly 300,000 meals we provide daily to customers. "We welcome the opportunity to do what it takes to respond positively to their findings. They help us to continuously improve: we always want to do better, even when we are performing very well. "The job of regulators is to identify any problems, and our job is to take their findings very seriously and respond proactively. "We are celebrating our third decade of providing quality meals and snacks for our customers. Over the years, as regulations have evolved, we continue to partner with regulators to implement new guidelines. "FFG is the only airline catering company member of Institute of Food Safety and Health (IFSH). This consortium of FDA, industry, and Illinois Institute of Technology (IIT) addresses food safety/nutrition issues. "FFG is the only airline catering company that is a Gold Level Sustaining Member of the International Association for Food Protection (IAFP). IAFP is the world's pre-eminent scientific organization dedicated to addressing the safety of our global food supply. Other IAFP Gold Sustaining members include Coca Cola, Heinz and Kraft Foods. "FFG is subject to ongoing federal, state and local health inspections, including inspections led by the US Food and Drug Administration (FDA). At the conclusion of a site inspection, an FDA inspector commonly presents a FDA Form 483 – List of Inspectional Observations. FFG takes every FDA observation on a Form 483 very seriously. "You have asked about the single FDA Warning Letter related to issues at our Newark, NJ facility. It involved a disparity over interpretation of FDA's own Guidance Document for safe handling of seafood, plus some specific infrastructure issues. "All immediate actions related to Newark facility's infrastructure issues have been completed. "Interpretation points regarding FDA Seafood Guidance Document are resolved. "Public health was never threatened by this difference in interpretation of the FDA Guidance Document. No unresolved issues compromise product safety. "We take every finding seriously and address each one in a timely manner. As regulations evolve, observations in FDA Form 483's serve as a valuable tool for continual improvement of food safety and quality at FFG. "Thank you for this opportunity to respond to your inquiry. Food Safety is a Number One priority at Flying Food Group." "At Southwest Airlines, the Safety of our Customers and Employees is our highest priority. We work every day to provide a safe environment and an enjoyable experience. As part of this quest, Southwest Airlines works closely with all regulatory agencies and officials to ensure the highest quality of service and highest level of Safety. As with all airlines, our operation is regularly inspected by the Food and Drug Administration (FDA) Interstate Travel Sanitation Inspectors. "If concerns are raised during an inspection, we take immediate measures to react to the specific feedback. In addition, we continue to implement multiple layers of protection to ensure complete compliance to all regulations."